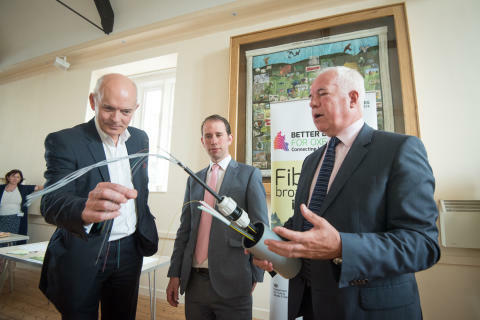 Around 230 Ashbury homes and business are now able to access faster fibre broadband as a result of the Better Broadband for Oxfordshire partnership, led by Oxfordshire County Council and BT as part of the Government’s Broadband Delivery UK programme. Residents, local businesses and representatives from the partnership were in Ashbury on Friday (29 July) to celebrate the village becoming the first area of the district to benefit from the second phase of the roll-out, which is being co-funded by Vale of the White Horse District Council and the OxLEP (Oxfordshire Local Enterprise Partnership). As the Openreach network is open to all communications providers, local households opting for an upgrade will be able to order fibre broadband with download speeds of up to 80Mbps and uploads of up to 20Mbps* from a wide range ofservice providers.